At the three-day Control System Technical User Meeting, instrumentation and control developers and experts from the Domestic Agencies and their suppliers were able to interact with the ITER Control System Division to discuss design approaches, implementation difficulties and missing features. From 9 to 11 December 2014, the Control System Division hosted the 1st Technical User Meeting on the ITER control system. 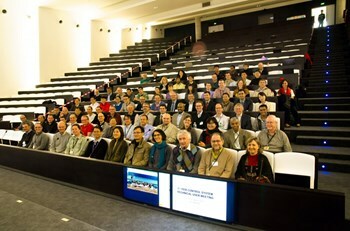 Over 150 people attended, including experts from the ITER Organization and all seven Domestic Agencies. The ITER control system is the functional integrator of the project, composed of more than 200 local systems supplied by the ITER Domestic Agencies in the context of 89 in-kind procurement packages. The integration of the individual systems into a coherent integrated control system to operate ITER is one of the project's major challenges. The objective of the Technical User Meeting was to bring together the people who are designing and manufacturing the instrumentation and control (I&C) of the ITER plant systems. More than 30 presentations were given over three days, covering the magnet systems, coil power supply, heating systems, diagnostics, cryogenics, cooling water, vacuum, buildings and port plug test facilities. The meeting was a unique opportunity to share and align the I&C design approaches that are employed by Domestic Agencies and their suppliers, to communicate about implementation difficulties, and to discuss missing features. Such quality exchange was especially useful for procurement packages like electron cyclotron heating or magnet system power supplies, which have particular integration challenges because they are split and delivered by several ITER parties. The Control System Division received valuable feedback in the application of the Plant Control Design Handbook and on the use of CODAC Core System, which will allow it to fine-tune the priorities for the coming releases of ITER control system software. Participants left the meeting with greater awareness of development work going on for ITER instrumentation and control around the world. This awareness will aid in the design and manufacturing of individual plant systems and, even more importantly, the integration of the systems in the final control system that will operate ITER.